So after heavy contemplation, we decided that with fall rapidly approaching- we should add some fun new scents to our salon… Besides freshly brewed coffee, hot apple cider, and pumpkin spice lattes; what better way to do that then delicious smelling candles!? The tricky part however, would be finding a candle that would not emit even more chemicals in the air; because as a salon we have nail fumes, color fumes, etc. After doing some research, I found a brand called Soi. 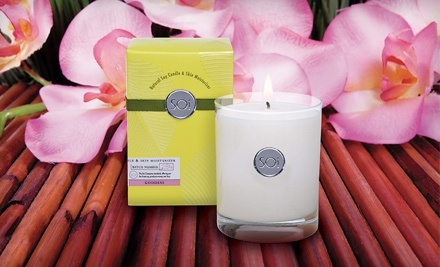 Soi Candles are hand-poured using 100%, FDA approved, kosher soy oil and burn cleaner than paraffin-based candles. These candles burn about 40% longer than wax candles, are soot-free and do not emit any harmful toxins (like Benzene) into your home. Unlike wax, soy oil burns coolly at 106º into a reflective pool of soy that always remains warm to the touch and will not burn little hands. Which… is the BEST PART because as the candle burns, the melt pool accumulates and can then be used as a skin moisturizer!! Let me just tell you… The girls walk around all day dipping their hands into these candles and not only do we all smell great but our hands are super moisturized! !